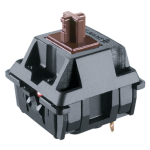 Exclusive to Mechanical Keyboards Inc, the KBParadise V80 with Matias Quiet Click switches and TaiHao ABS doubleshot keycaps! Dimensions 14.10" x 5.30" x 1.40"
I've been using this keyboard for 1 year now. I loved it when it worked. The tactile feedback is good and it was somewhat quiet. Unfortunately, I'm now down to my third switch defect. The copper leg that makes the contact inside the switch is prone to breaking easily. When that happens, the common issue everyone is having is key chatter (key presses being repeated unintentionally). It makes the keyboard highly unreliable. It might work today but who knows if it'll work tomorrow. I sent my keyboard for RMA and it was fixed by Mechanical Keyboards once but I'm done now. Stay away from this keyboard. This is one of my favorite keyboards to type on. 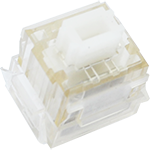 The switches really have a great feel and aren't silent but have about the same noise as when typing on a cheap keyboard. I did have a little key chatter in two keys but the problem went away after a bit of typing and it hasn't happened since. I did contact tech support and they immediately offered an RMA which was nice, but I ended up not needing to. The keycaps have a nice texture to them but do feel kinda "thin". They are doubleshot ABS and seem to be holding up quite well. Even with the added cost of the converter ($63 when I bought it), I'm still happy I bought this keyboard. The build quality is very nice, the switches feel awesome and keycaps look great. Recommended. Unfortunately, I am returning this keyboard, too much key chatter. 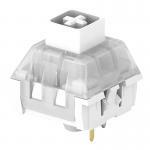 It may be ok if you are confident that you can service and fix the chattering switches (4-5 switches have this problem). As a side note, the keycaps are very hard to pull compared to those with Cherry-style stems. Build quality is nice. Case feels solid, barely any flex. Rubber coated feet work well. The rear flip-out feet are easy to flip, but hold the keyboard stably. Key switches are nicer than any cherry I have tried, but not perfect. Key feel is inconsistent between different keys. It gets better with use, but differences in force profile and sound are still noticeable. 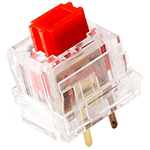 Be aware that keys are very wobbly, but I think this is just how matias switches are. Keys are textured ABS. 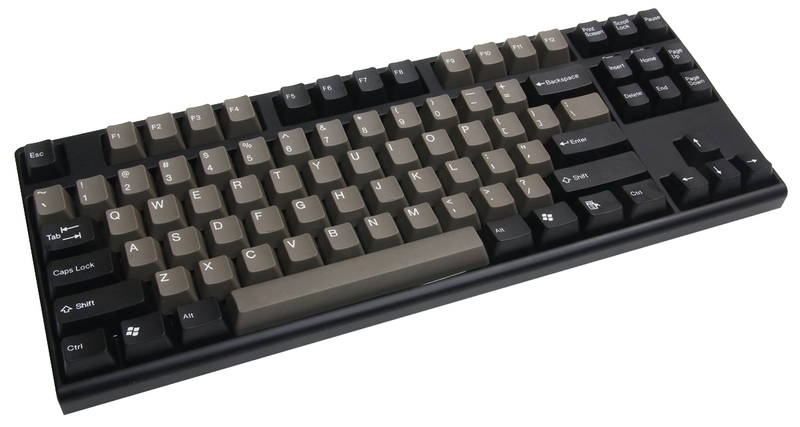 Not too bad, but texture on the home row and frequently used keys will wear off very fast. On mine, the home row, shift, and spacebar are smooth and shiny where my finger normally pushes them. Keyboard comes with gutters to route the detachable cable, but they are unusable - too narrow to force the cable inside all the way. Matias click is nowhere close to IBM Model M buckling springs, but IMO far better than Cherry Blue. So far so good. Bought this for the office since it's a lot quieter than my WASD Code with MX Clears. Seriously this thing is super quiet. No issues so far, and I really like the Dolch caps, though I wish they were a bit thicker. The caps are on TIGHT, so I found that my puller dented a few at the bottom. Nothing you can see without taking the cap off, but I felt like I was going to break the switch when I pulled a few off. The caps and scroll lock LEDs light up bright white, by the way. While flipping the space bar I noticed that the stabilizers do not come lubed from the factory. All the stabilized keys were wobbly and loud, so I went down to the hardware store and got a tube of lube. After lubing both shift keys, backspace, enter, and the space bar, they are much much quieter. I highly recommend you lube these keys if you are a stickler for noise, like me. I've had this board since it came out, and I love it. I have a lot of keyboards (various Cherry and Topre switches), and this one takes the cake. Matias says it right when they say that it's the only switch designed to be tactile - compares favorably to any Cherry switch (or IMHO Topre). The build quality is solid, and the doubleshot dolch caps are great. Overall, I couldn't think of anything else that I want, except for maybe a nonprinted keys option and a doubleshot command key to replace the windows key. I've had this keyboard for two months and wish I could give it a higher rating -- it looks and feels sweet -- but the 'k' key drops keystrikes and/or repeats, apparently at random, and looking on Massdrop, I've found several others with similar issues, some worse than mine. I've pulled the keycap off a half-dozen times, tried to scrape off any excess flashing, cleaned the switch, etc., etc., etc. No luck. I couldn%u2019t replicate the problem by depressing the switch stem without the keycap installed, so I figured it must be something with the cap, but then I switched it with a neighboring keycap that worked fine, and same problem. Sometimes it won%u2019t register a strike at all, and then, out of nowhere, it will lay down two, three, or even five strikes simultaneously. It drives me crazy, has wasted way more time than it%u2019s worth, and I%u2019m afraid I%u2019m going to have to give it up and write this board off as an expensive mistake. 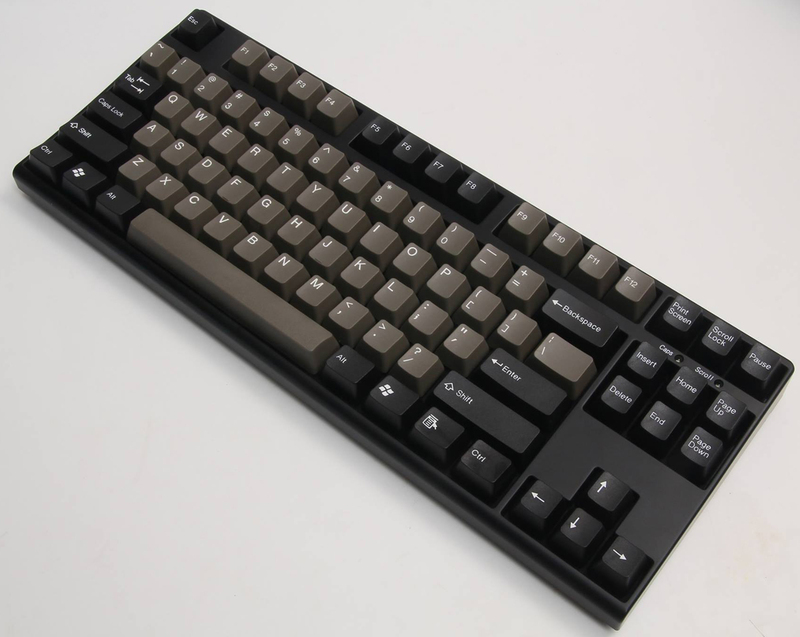 I'm sorry to do it, because the build quality is good, the dolch keycaps look great, the board feels very solid (no squeaks or pings), and the switches -- a good deal stiffer than Cherry Browns -- are smooth, responsive, and just as quiet as advertised. Very disappointing. After using two V60s, I got this V80 to replace one of them which developed an issue. The keyboard feels very solid and has a good weight to it, the key caps are very nice and look lovely, and the switches feel wonderful.